Ever since I watched the character of Robert McKee (played by Brian Cox) in the Spike Jonze film ‘Adaptation’ (2002) claim that Casablanca is "the finest screenplay ever written", I wanted to read the screenplay of this 1942 classic. I finally managed to do that in the third week of January. And it has inspired me to indulge in a detailed study of the script. I am very sure this is going to be an immensely fruitful exercise for me. If you have not watched the movie, I strongly recommend you to do so. And if you have, I hope this series will be enjoyable for you. For making the best use of this, you should read the screenplay by clicking here. The method I have used to study this script is an adaptation of what Scott Myers suggests on his wonderful blog. I am thankful to him for this. And then I have modified it to suit my approach. I have broken the 126-page script into ten parts, each roughly 11 to 14 pages in duration. So my study of the script will be shared on this blog in ten different parts. I must also be thankful to Robert McKee whose observations on the film, in his book ‘Story’, have given me tremendous insight into it. While discussing the events of every part, all major plot points will be marked in bold and all characters who are appearing for the first time in the film will be mentioned in CAPITALS. For the sake of this series, I am not taking ‘scene’ in its technical, literal sense. There are long sequences in one scene that I have broken down to different scenes in the Step Outline. On the other hand, there are short scenes that actually form one major scene – so I have clubbed them together. 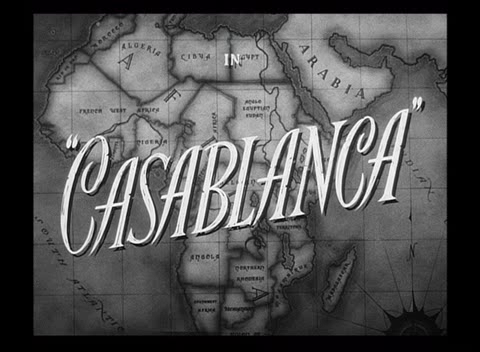 A brief note on the historical backdrop of the film: The film is set over three days in Casablanca, Morocco, during the Second World War, December 1941 to be precise. The Third Reich (Led by the Nazi Germany, and supported by Italy and Japan) have occupied several parts of Europe, including the forced surrender of France eighteen months ago (setting of the back-story of the romantic pair of Rick and Ilsa). The unoccupied France, of which Morocco is a colony, is under the rule of Vichy, the French puppet government controlled by the Nazis. Several European refugees and Americans want to run away to the US through Lisbon in Portugal. But it is tough to reach Lisbon directly through Europe. Hence several of them reach Oran, which is the port city of France-occupied Algeria on the Mediterranean Sea and then travel to Casablanca and wait to find exit visas to Lisbon which is across the Atlantic from Casablanca, and not very far. Today, it takes 80 minutes to fly between these two cities. So, this film, set in Casablanca, brings to us characters from different parts of the world, of different allegiances and political affiliations. I'm looking forward to your reaction to this series of posts!